A great classical guitar for a serious player, the Merida Diana DC-15SP has both the looks and the tone that anyone would enjoy. Premium woods and great build quality are something to expect as standard from the Merida brand, providing beautiful guitars at attractive, economical prices which all guitarists can get involved with. The most impressive part of this guitar without any doubt is the solid cedar top. Solid woods are extremely resonant and cedar is the perfect choice for a classical guitar such as the Merida Diana DC-15SP. Responsive to great variance in dynamics, this guitar will sound great for classical pieces where the difference between more subtle finger picked sections and louder strummed sections is integral to the music. The spalted maple looks great on the back and sides of the DC-15SP, showing that attention has been paid to great looks and performance across the whole guitar. 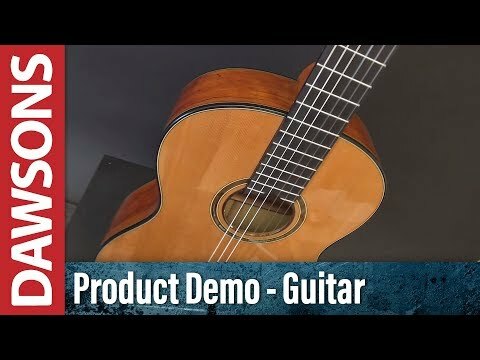 A classic combination of a mahogany neck and pau ferro fingerboard enables you to perform a variety of classical techniques, all of which will sound great and feel natural. The Merida Diana DC-15SP has some extremely impressive hardware on offer, including a Graphtech nut and saddle pairing. The Graphtech nut and saddle helps to maintain precise tuning of each string. All of the onboard hardware aims to keep this guitar reliable in both construction and tuning stability. The Graphtech Black Tusq XL nut and saddle are made from a self-lubricating material that allows strings to move freely with no "hang-ups", therefore reducing friction and any tuning problems you may have encountered on other guitars. High quality tuners are used too, making sure your tuning is stable and becomes less of a worry during performance. The Merida Diana DC-15SP Classical Guitar is a stunning classical model with a comfortable playing feel and superb tone, at an affordable price.